Last year I crossed the line. The IDUG conference in Europe is now my favorite. But the North American technical conference is a very close second. Nowhere else can you get this level of detail and the contacts with IBMers and peers. I now get two favorite weeks a year! The conference starts on Sunday, April 29th. This day has extra-cost Educational seminars, including a certification crash course. Monday starts out with the keynote and then the spotlight sessions in the morning and a full afternoon of sessions. Tuesday and Wednesday are jam-packed with sessions, SIGs and Panels. Thursday offers Three sessions in the morning or some hands-on Labs. The closing time is the last seating for the day. To take a test, you have to have a Pearson Vue ID and password. If you don’t already have one, create one before the conference. To me, the biggest value in certification is that in studying for it, you learn things that you don’t do every day and stretch yourself. Also, some employers need certifications for their IBM Partnership status. Different employers place different levels of importance on certification. Breakfast is usually not included, and you must find and purchase it on your own. Lunch is usually provided – sometimes buffet, sometimes sit-down, occasionally lunch box. Lunch is often in the Expo Hall. Evening events sometimes offer appetizers, but rarely complete food, though the Wednesday evening event may offer food this year. Lunch on Thursday is usually only included if you attend one of the labs. The Exhibit Hall is where vendors set up booths to sell their software or services. When it comes down to it, these are the people who pay for the conference. They also offer a “Passport to Prizes” game. You’ll get a card in your registration materials. Take it around to each vendor on the card and get them to stamp it for you. The write your name on it and drop it in a slot. At the end of lunch on Wednesday, they draw out the winners. Who doesn’t want a chance at something with a 1 in ~300(is that how many people complete them? It is not everyone) chance of winning? I won a nice Bluetooth speaker last year, and several years ago I won a $50 Amazon gift card – not too shabby! The Exhibit hall is where everyone goes to hangout when it’s open. Wander around and find people you know or have heard of and strike up conversations. I absolutely love to meet readers of the blog – it is my motivation to keep writing. Please, if you see me, walk up and introduce yourself. There are networking events in the evenings sometimes. On the Db2Night Show, IDUG mentioned that they will be doing the dine-around this year. The dine around allows you to sign up on a list near registration to have dinner one evening with a small group anchored by a couple of speakers. I think that if this happens it may be on Tuesday, but I’m not sure. Keep your eyes open. This was one of my favorite events in the past. The big party is on Wednesday night at the Trocadero Theatre. You’ll need to pick up an invite from either the IBM, DBI, or Rocket booths to get in, and don’t forget to bring your conference badge. This is a short walk from the hotel. This is an event that should offer a full dinner. The website for setting your agenda ahead of time is feeling a bit dated, but the Mobile app is better. You’ll also get a nice printed conference grid that usually fits nicely in the back of your badge to easily be able to look at the sessions. On the left, I pull up the Agenda with the Time tab selected. On the right, I go to the Registration page, click on “Register”, and then Under “Already Registered”, click on “View Your Registration”. I then click the “My Agenda” tab, and the “Edit Agenda” button. 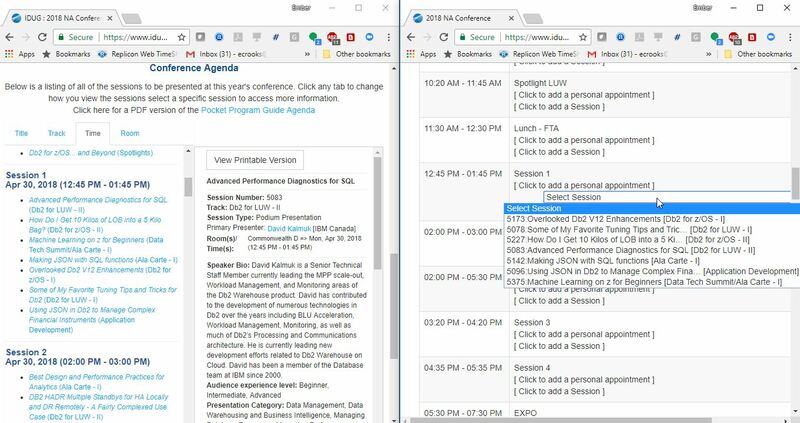 This layout lets me see all of the sessions for a time slot, click on them to get the speakers and the details of the presentation, and then on the right pane, add one or more sessions to that time slot. Note that the sessions you pick here may or may not show up in the mobile app once it becomes available – some years they have, and some they haven’t. You can add more than one session to each slot, so if there are two you are debating between, add them both and you can decide at the conference. You can also select what order you want the sessions in. Adding sessions in no way reserves a spot or anything – they don’t reserve spots at IDUG. Each of the tracks offers a session in every time slot. If you want a good visual representation of this, take a look at the Pocket Program Guide Agenda. A paper copy of this will be included when you get your badge, and is something I refer to throughout the conference. If you’re fairly new to Db2, note that z/OS topics often do not directly apply to LUW and vice-versa. The two do meet, however, at application development. It can also be interesting to expand your horizons and learn something about the other side of the fence. Always look at the “Audience expereience level” to get an idea of what a session expects you to know. Some are not correct, but if you’re a beginner, going to sessions that don’t include the beginner tag might be frustrating, and if you’re an expert going to sessions that are only targeted at beginners may be equally frustrating. Before the conference, think if there are any specific topics you want to focus on. My focus topics always include HADR, Security, and SQL. This year, I’d like to catch some sessions on Replication. Monday 2 PM: Mark Ryan – Using Db2 LUW with DSX (Data Science Experience) to solve practical machine learning problems in Congress C – I caught this presentation in Lisbon, and thought it was quite a good one on DSX. Great if you’re interested in Jupyter Notebook and Data Science. Monday, 4:35 PM: Michael Krafick – DBA Crash Course in Commonwealth A – This is the session to go to if you’re newer to Db2 in this time slot. Mike has an entertaining presentation style and has won best user speaker more than once. Monday, 4:35 PM: Keri Romanufa – The Latest from the Lab, and a Look into the Future in Commonwealth D This is the session to go to if you are experienced with Db2 in this time slot. Keri has worked with Matt Huras for years, and with his retirement, is taking over some of the sessions he used to do. I met her at IDUG in Lisbon, and wouldn’t miss her sessions. Sometimes sessions like these cover some of the future enhancements coming in later versions or fix packs. Tuesday, 1:00 PM: Josee St-Hilaire – VSP – Successfully Managing Performance of 100’s of DB2 LUW Databases in Commonwealth D – The VSP’s are a special kind of session that only compete against other VSPs. There is usually only one VSP for LUW in any VSP time slot. DBI’s VSPs often offer a gift giveaway of something cool, and their software has some neat features. I haven’t met Josee before, but I have met her colleague, Mike Petkau, and their company really uses DBI in the real world in a big way. Tuesday, 3:00: Special Interest Groups(SIGs) – A number of good options in this slot depending on your interests. I’ll be one of the presenters for Db2 LUW for Beginners — 3 in 75 Minutes. If I wasn’t there, I’d probably go to SQL and NoSQL or Db2 and Open-Source. If you want a really interactive session, Fun With SQL is always a blast – everyone in the room is grouped into teams and competes/cooperates to write SQL solutions to problems. Wednesday, 9:20 AM: Pavel Sustr – Table Space Odyssey in Commonwealth D – This session should be marked at the Advanced level. I saw it in Lisbon, and it was my favorite session of the whole conference. Geek out with Pavel on details of tablespaces you may never even have considered before. Wednesday, 9:20 AM: Calisto Zuzarte – SQL Query Writing Tips To Improve Performance in Db2 and Db2 Warehouse on Cloud in Congress B – Sit close to the front, though. Calisto is soft-spoken, but brilliant. Wednesday, 1:05 PM: Ember Crooks – Using Jupyter Notebook for Db2 Administration in Congress A – Of course I would recommend my own session, but this one is really cool. I often struggle with how to learn new things and get into topics like data science when my day job just running Db2 keeps me so busy. In this session, I’ll do some education on Jupyter Notebook, and a live demo on how to use Jupyter Notebook for Db2 Administration – the stuff I do every day anyway. This session in Lisbon was rated as one of the top 10 of the whole conference by attendees. Wednesday, 3:40 PM: Db2 LUW Mini-Panel! In Commonwealth A Not counting last year, this is usually the best session of the conference. It would be even if I wasn’t on the Panel again this year! I love to hear what people ask. Last year they combined the LUW and Z panels, and it was not amazing. This year they’re separate again, and hopefully in a smaller room. Wednesday, 4:55 PM: Completely torn in this time slot. I’m interested Leo Pedron’s session on leveraging the Amazon cloud for Db2. I like the sound of Michael Roecken’s session on HADR updates, and suspect I could learn something from him on it, even though it is a topic I could present. And the session on Splunk sounds interesting too. Thursday, 8:00 AM: Ember Crooks – SQL Fundamentals: Writing SQL with examples on 11.1 System Views and Table Functions in Congress B This is directed at beginners and those with less experience with SQL. I gave a similar presentation several years ago, but I’ve added some kinetic elements. “Kinetic” in this context means “throwing things”. Come and check it out! I know it’s early on the day after the party, but I’ve found some of the best sessions tend to be on Thursdays! On a side note, whoever keeps putting me head-to-head with John Hornibrook, stop! Second conference in a row I haven’t been able to attend a session of his because I was presenting! Thursday, 10:35 AM: Dale McInnis – DB2 Recovery best practices: learn the latest to address key scenarios in Commonwealth A Dale is one of the presenters I work my schedule around. Even if I’ve seen a presentation of his, I usually pick up something new watching it again. The mobile app is now available for use. Any sessions you added to your online agenda should show up in the mobile app. To login to the mobile app, you download the IDUG app from the app store for your phone type, then you should be able to select the correct conference and login. On first login, it will have to download some additional data. I was fairly happy with the mobile app the last two years. It looks better than the website again this year, allowing for searches by speaker, which weren’t working through the website for me. Check out the Db2Night Show for a nice presentation about the conference. The IDUG Website is the master source of information. Twitter is often pretty active about the conference #idugdb2, @IDUGDb2. Great overview and insight Ember ! Hope you have a wonderfull time there. You are a great advocate for the IDUG Community and Db2 in general. One day I will have to cross the Atlantic to attend the IDUG NA conferences; It sure looks fun too! See you in Malta Nov 2018.